Kheema Calzone, right out of the oven! And then I remembered! I had store bought pizza dough! 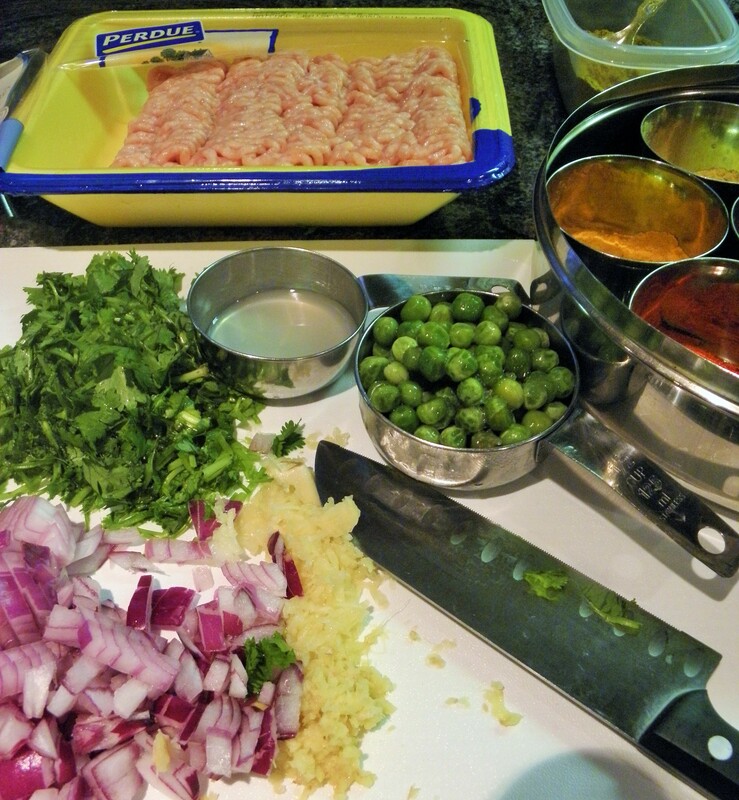 And before I knew it, I started to make the kheema filling. I decided to make Kheema Calzones for dinner. 1/2 cup frozen green peas, defrosted. I used the Laxmi brand frozen peas. 1 package (16 oz) of store bought pizza dough, such as Trader Joe’s plain pizza dough. Leave it covered at room temperature. extra virgin olive oil to lightly grease the baking tray and to brush the top of the calzone before baking. Heat the canola oil over medium high heat and add the minced onion. Stir fry the onion for a couple of minutes, or until translucent. Add the grated or minced garlic and ginger, stir for a few seconds to get rid of their raw flavor. 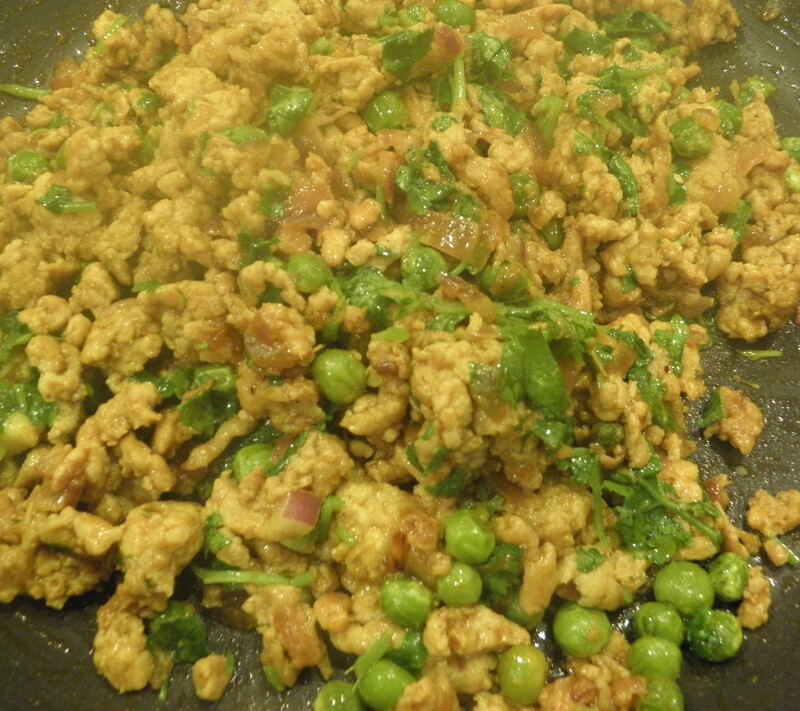 Turn the heat to medium, add the turmeric and garam masala powders, stir and add the ground chicken, green peas, and salt. Stir it well to coat the chicken and peas with the spice mixture. Brown the meat, stirring and breaking up the clumps for about 4 to 5 minutes. I like my ground meat really browned so I stir fried it for 5 minutes. Add the lime juice, the gochujang sauce and the cilantro leaves, stir to combine. Lower the heat to low, cover the pan and let the kheema cook for an additional 2 to 3 minutes or until the meat is fully cooked. Remove from heat and it let cool. While the Kheema cools, preheat the oven to 400 degrees. Lightly grease the baking tray with the extra virgin olive oil. Divide the pizza dough into 2 approximately equal parts and roll the dough on a lightly floured surface into 2 circles, each approximately 12 inches in diameter. Transfer one circle to the lightly greased tray. 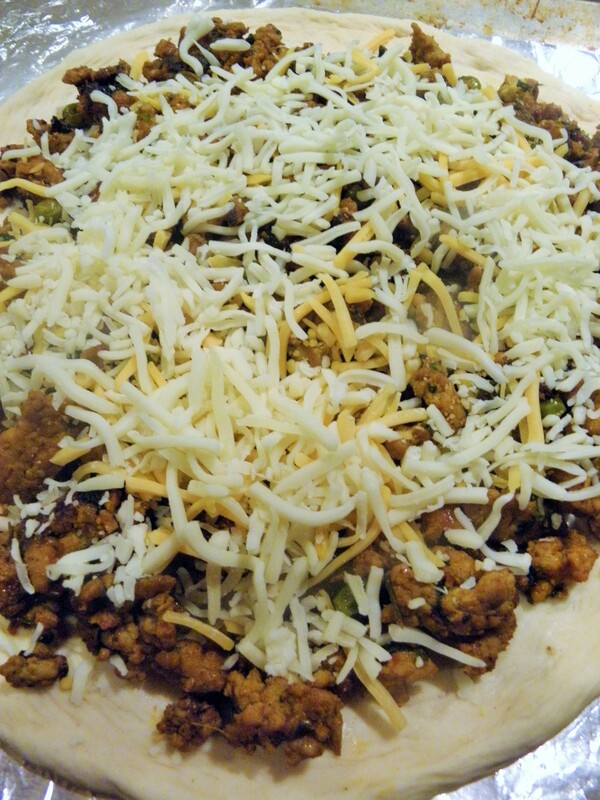 Top with the kheema and the shredded cheese mix leaving a ½ inch border around the circumference of the dough. 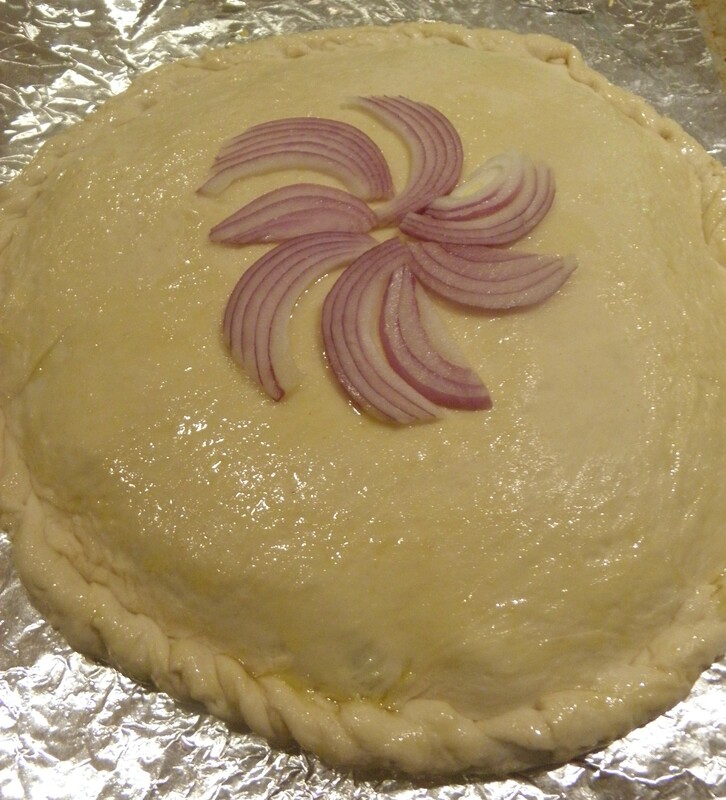 Top with the other circle of dough and pinch edges of both the dough circles together. 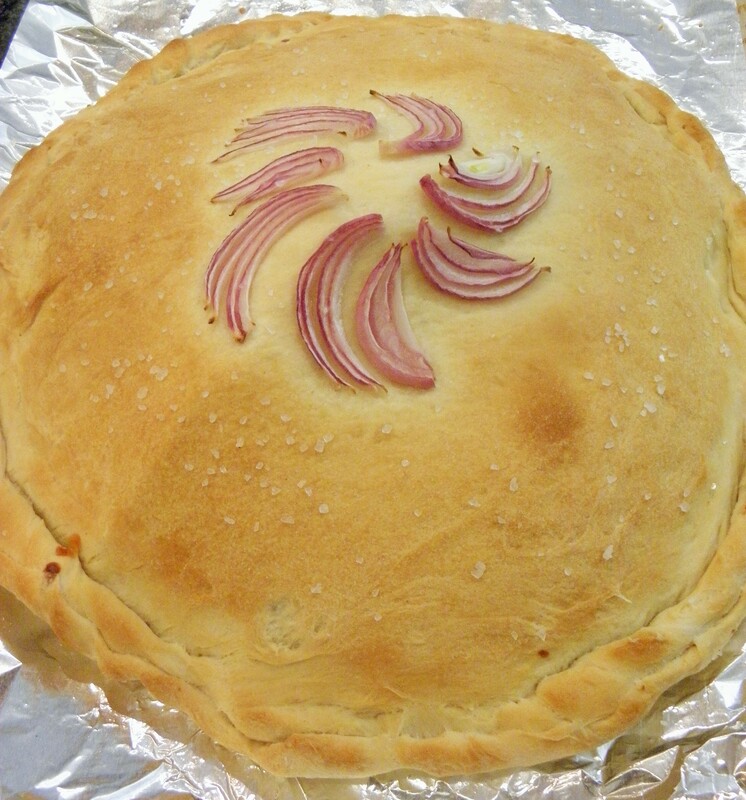 Brush the top of the calzone with the extra virgin olive oil, and top with the optional sea salt and onion. Bake in the preheated oven for about 20 to 25 minutes or until golden brown. Serve with additional gochujang sauce, marinara sauce or curry ketchup. 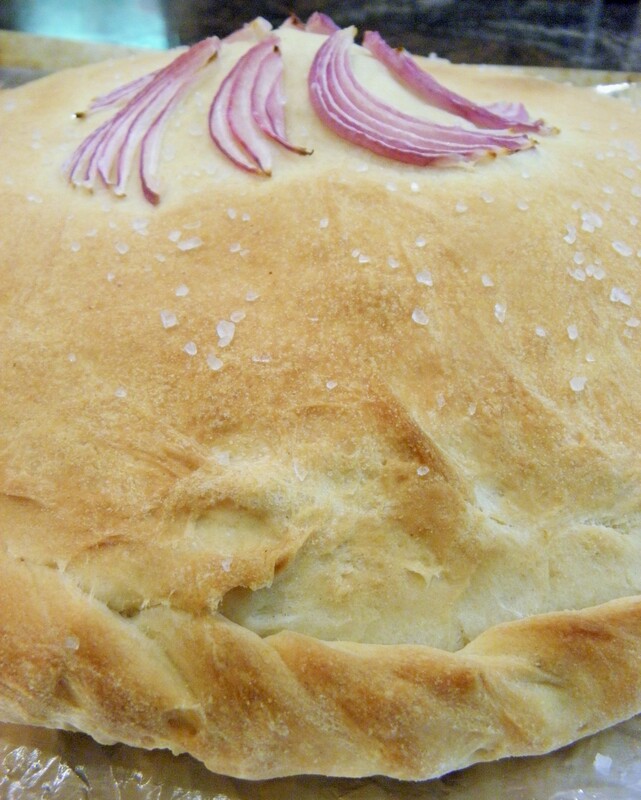 For dinner, I just made a simple salad with this calzone. 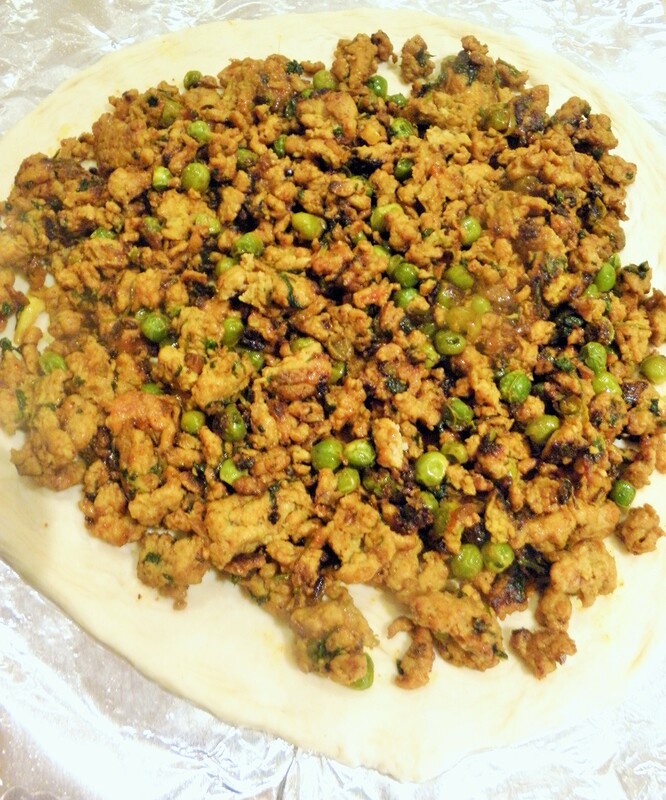 Hope the aroma of this Kheema Calzone fills your kitchen too! Enjoy! Sun kissed Besan Ladus for Diwali ! Thank you Sue! I am happy to know that there are other dreamers like me who dream about food! You are so talented to take it further and create a new recipe. Thank you so much for your kind words about my pictures and description of the Kheema Calzone. Thank you Sarah! Have a great week! Cannot wait to try it. Just became super hungry reading the descriptions and looking at the pictures. Thanks Anjali! I am sure you will like it too. This looks SO DELICIOUS!!! A simple salad sounds perfect with this Calzone. Yum!!! I bet your kitchen always smells wonderful. Thank you so much Pam! I appreciate your kind words so much! Perfect for the football game this weekend! Kheema (Indian spiced ground meat) Calzone is a crowd favorite. I will dream about food now because I am following a low carb diet plan and I am absolutely drooling at this Calzone. That is not fair. Why do yummy things have a calorie tag. So not fair!